Špitálka is a rare location near Brno’s centre. It offers an opportunity to link the historical city centre and Svitava river. 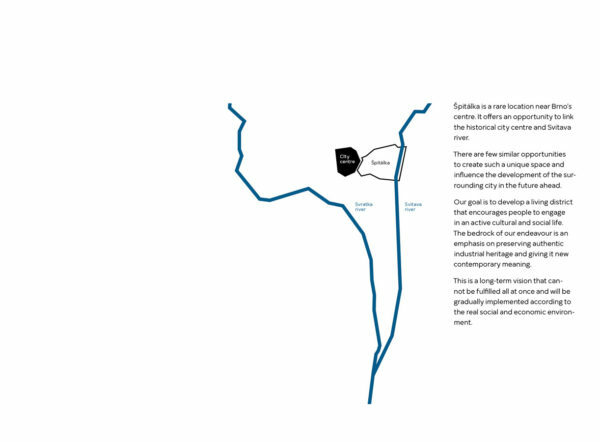 There are few similar opportunities to create such a unique space and influence the development of the surrounding city in the future ahead. 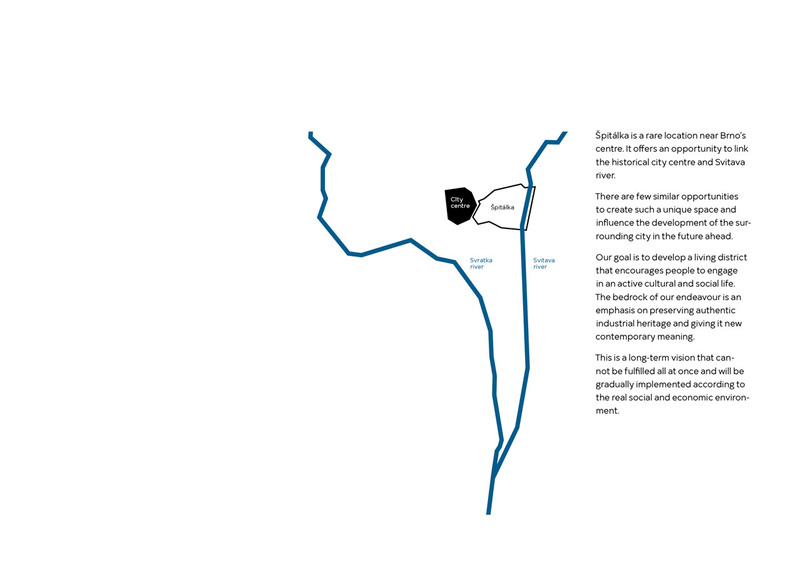 Our goal is to develop a living district that encourages people to engage in an active cultural and social life. 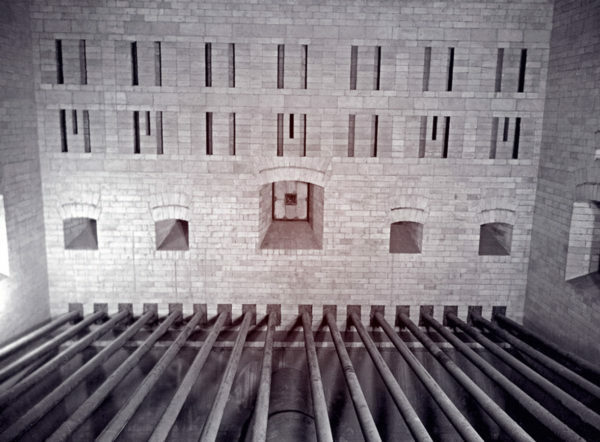 The bedrock of our endeavour is an emphasis on preserving authentic industrial heritage and giving it new contemporary meaning. This is a long-term vision that cannot be fulfilled all at once and will be gradually implemented according to the real social and economic environment. A large part of the area will be dedicated to public use in a series of linked parks and plazas. A park is a tamed natural landscape in a city providing grassy meadows, shade and winding, unpaved paths. It embraces natural morphology and irregularity. 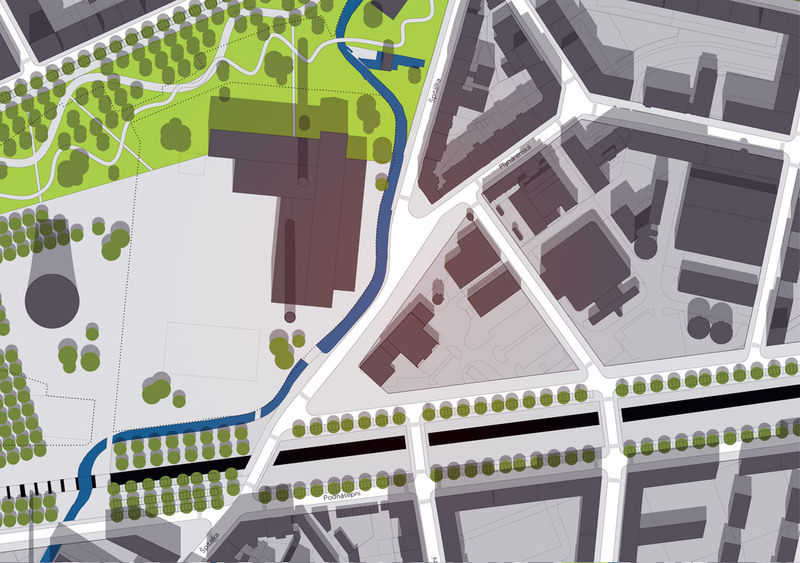 We are proposing a network of public parks to link the historical city centre to the Svitava river. 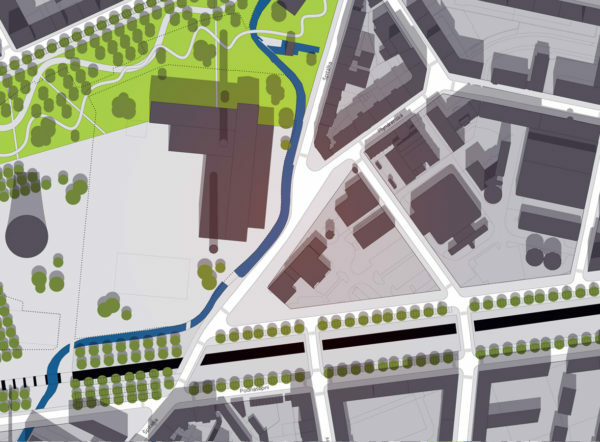 The current supporting wall in Koliště street will be replaced with a natural slope, and the area will be attached to Brno’s ring park system. 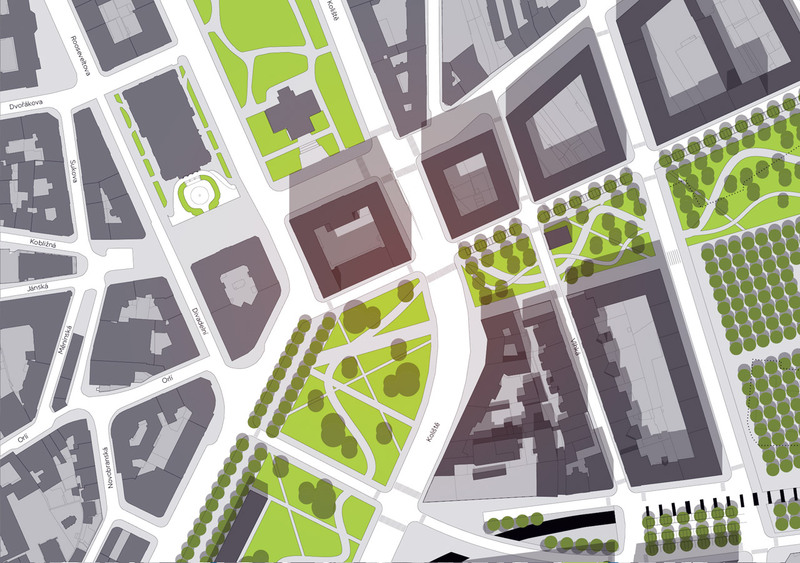 A plaza is a paved open space dedicated to public life. 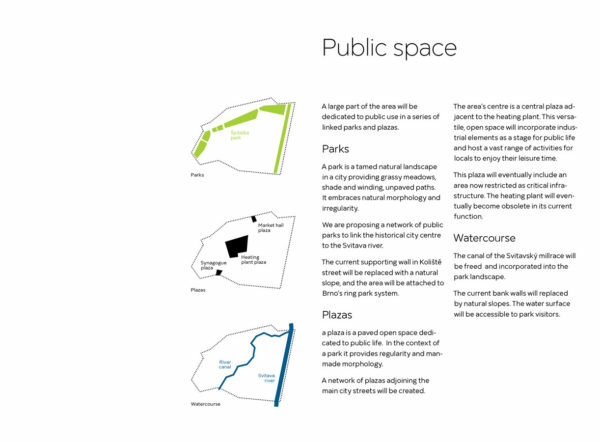 In the context of a park it provides regularity and man-made morphology. 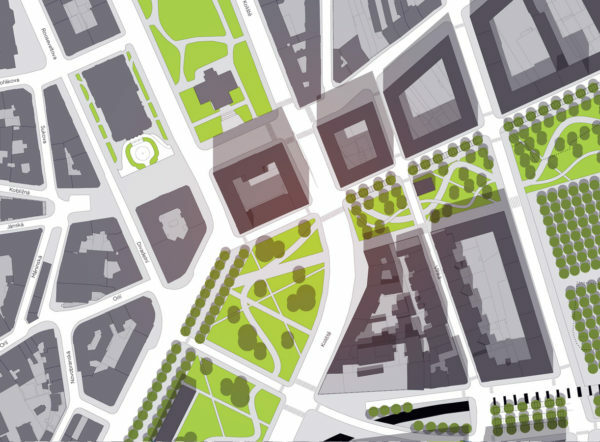 A network of plazas adjoining the main city streets will be created. 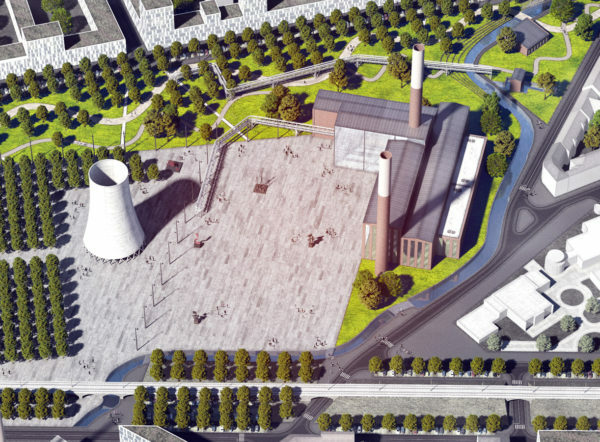 The area’s centre is a central plaza adjacent to the heating plant. 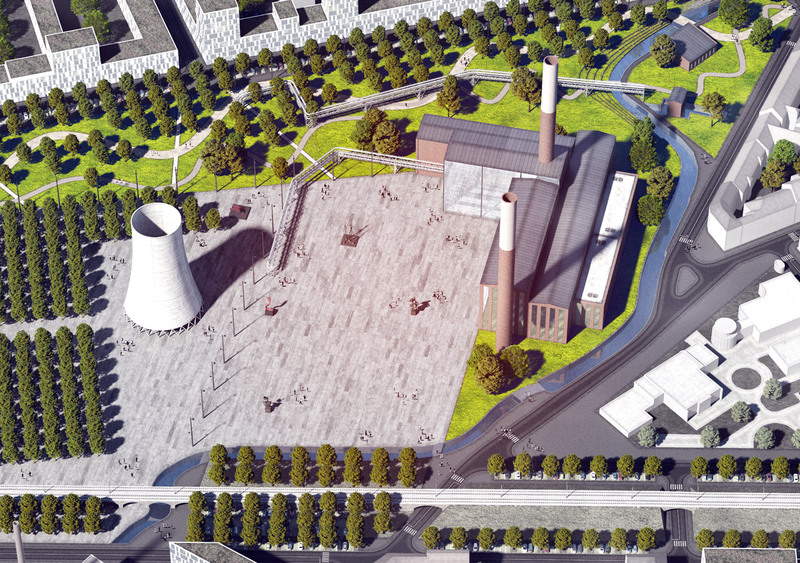 This versatile, open space will incorporate industrial elements as a stage for public life and host a vast range of activities for locals to enjoy their leisure time. This plaza will eventually include an area now restricted as critical infrastructure. 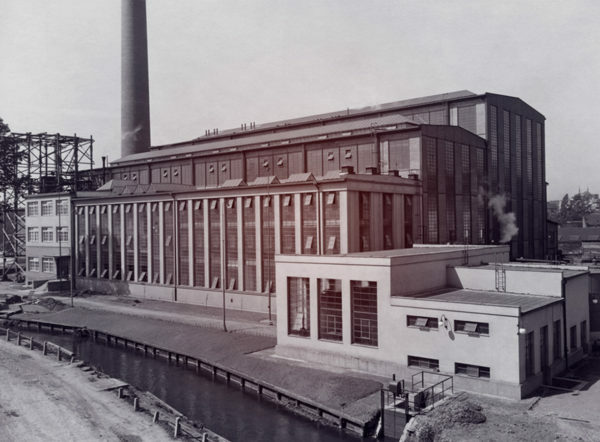 The heating plant will eventually become obsolete in its current function. 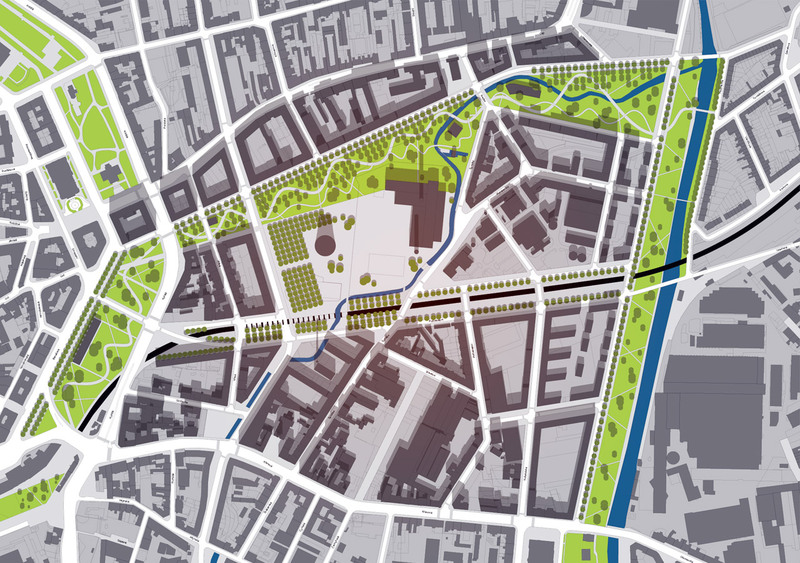 The canal of the Svitavský millrace will be freed and incorporated into the park landscape. The current bank walls will replaced by natural slopes. The water surface will be accessible to park visitors. The area of Špitálka today is like a gap in the city street network. The gap will be bridged by creating a system of new interconnections. Avenues are radial streets connecting the city centre to the periphery. 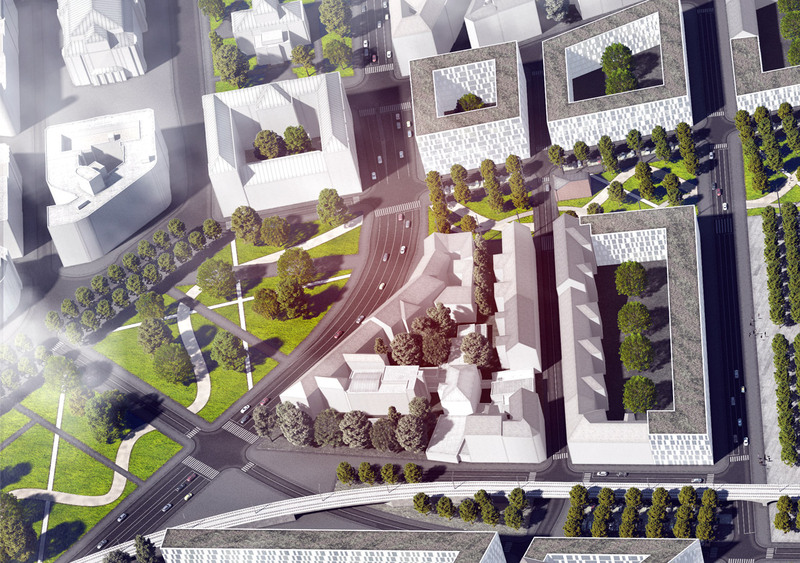 Two new avenues complementing Cejl and Křenova street are proposed. 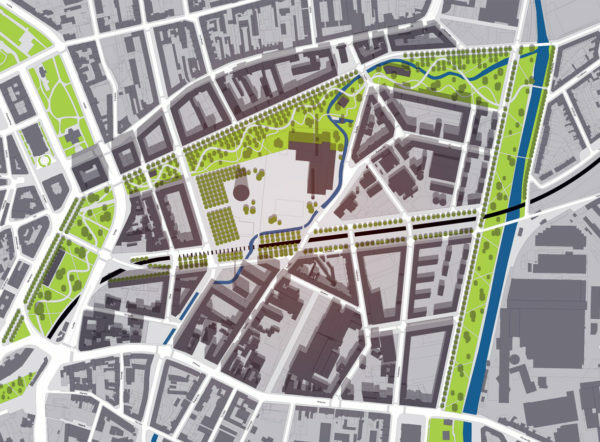 The northern avenue will cross the area of the former textile factory known as “Kemka” by locals (from German Kammgarnspinnerei). The local name will be retained and the street named Kemka avenue. The southern avenue follows the railway line. 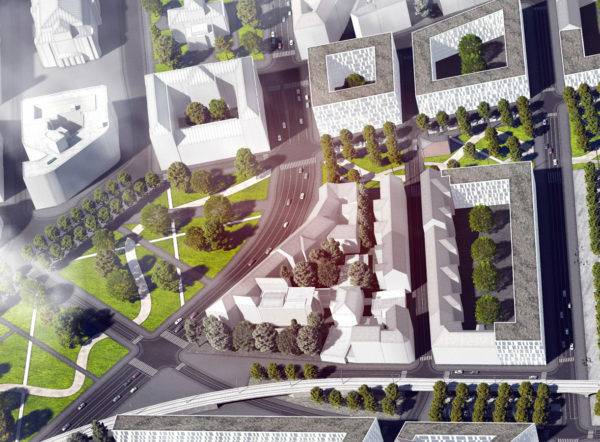 Each avenue will start at the city centre ring roads of Benešova and Koliště and extend eastward, then bridge the Svitava river and merge into the into Židenice street network. 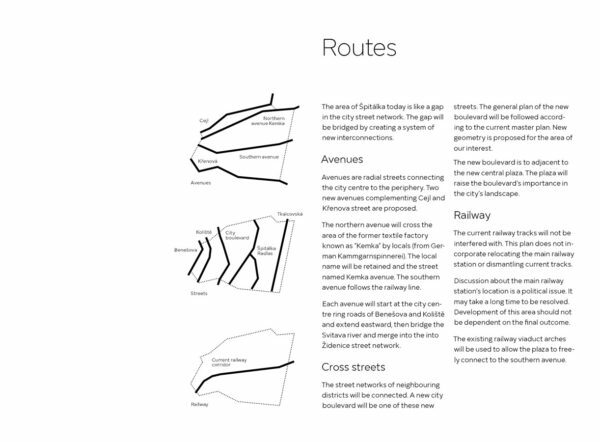 The street networks of neighbouring districts will be connected. A new city boulevard will be one of these new streets. 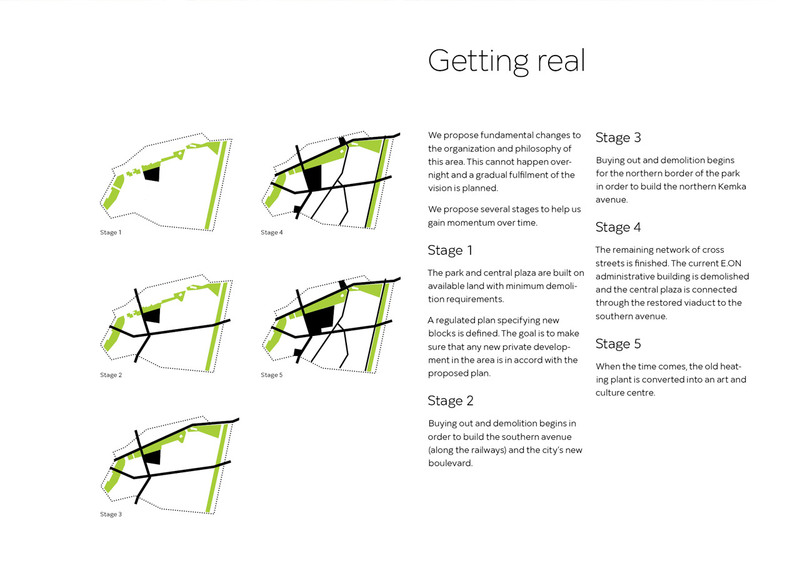 The general plan of the new boulevard will be followed according to the current master plan. New geometry is proposed for the area of our interest. The new boulevard is to adjacent to the new central plaza. The plaza will raise the boulevard’s importance in the city’s landscape. The current railway tracks will not be interfered with. This plan does not incorporate relocating the main railway station or dismantling current tracks. Discussion about the main railway station’s location is a political issue. It may take a long time to be resolved. Development of this area should not be dependent on the final outcome. The existing railway viaduct arches will be used to allow the plaza to freely connect to the southern avenue. 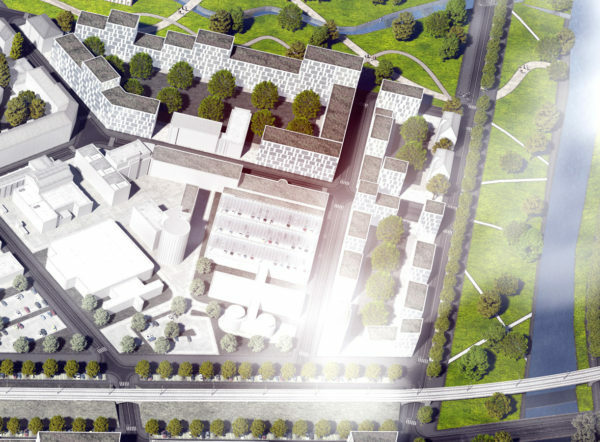 The unique industrial buildings in the public areas will gain new purpose in hosting a variety of activities for the public. 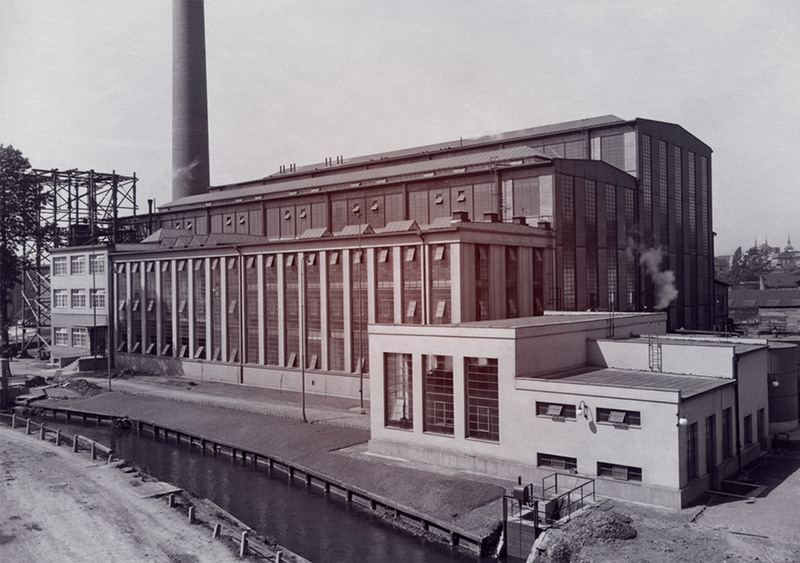 One of these monuments is the current heating plant. 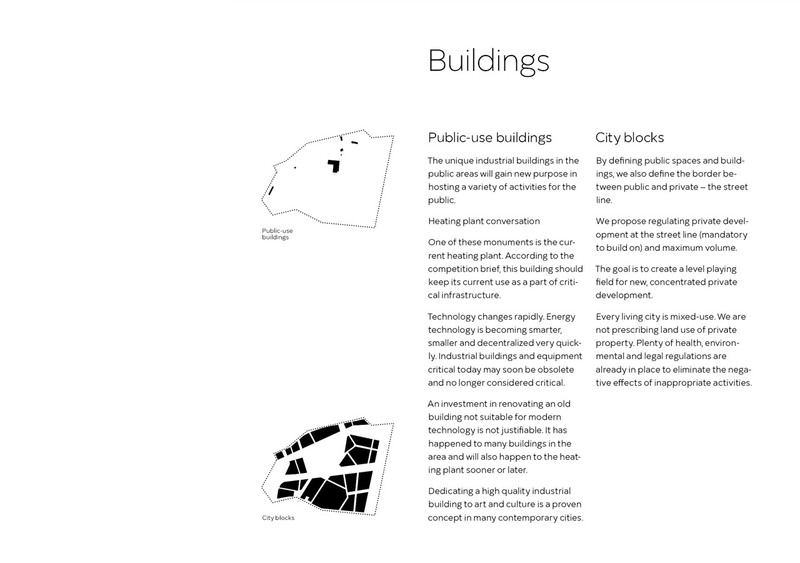 According to the competition brief, this building should keep its current use as a part of critical infrastructure. Technology changes rapidly. 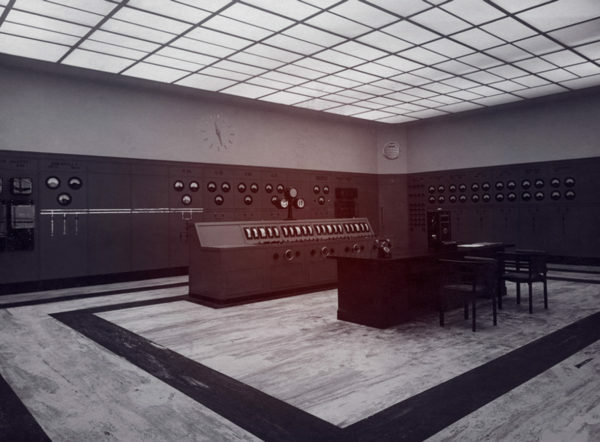 Energy technology is becoming smarter, smaller and decentralized very quickly. 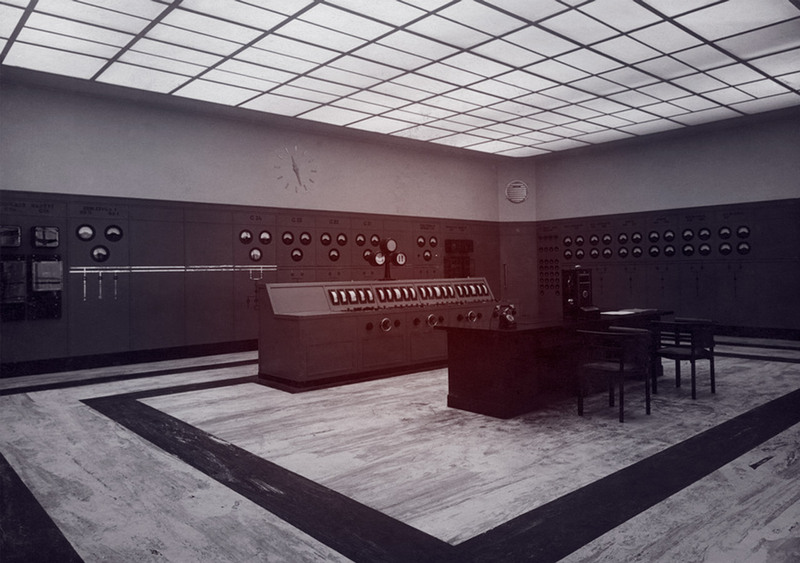 Industrial buildings and equipment critical today may soon be obsolete and no longer considered critical. An investment in renovating an old building not suitable for modern technology is not justifiable. It has happened to many buildings in the area and will also happen to the heating plant sooner or later. Dedicating a high quality industrial building to art and culture is a proven concept in many contemporary cities. 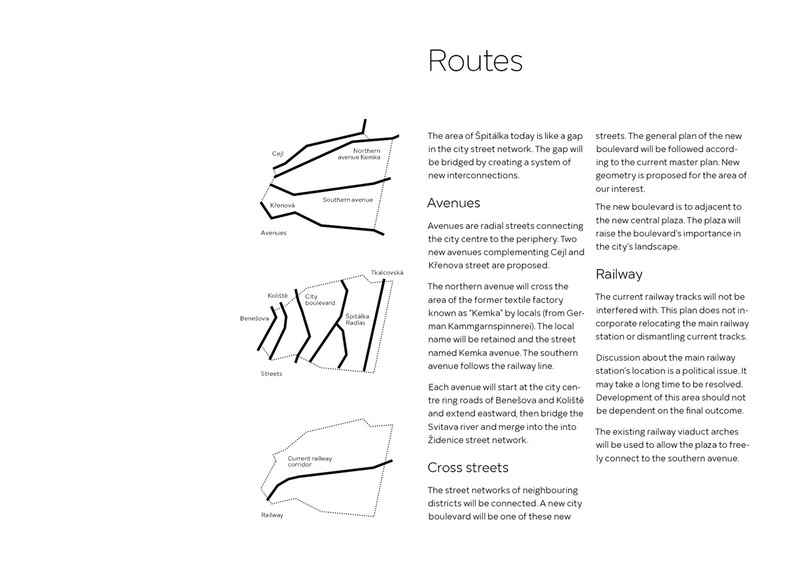 By defining public spaces and buildings, we also define the border between public and private – the street line. We propose regulating private development at the street line (mandatory to build on) and maximum volume. 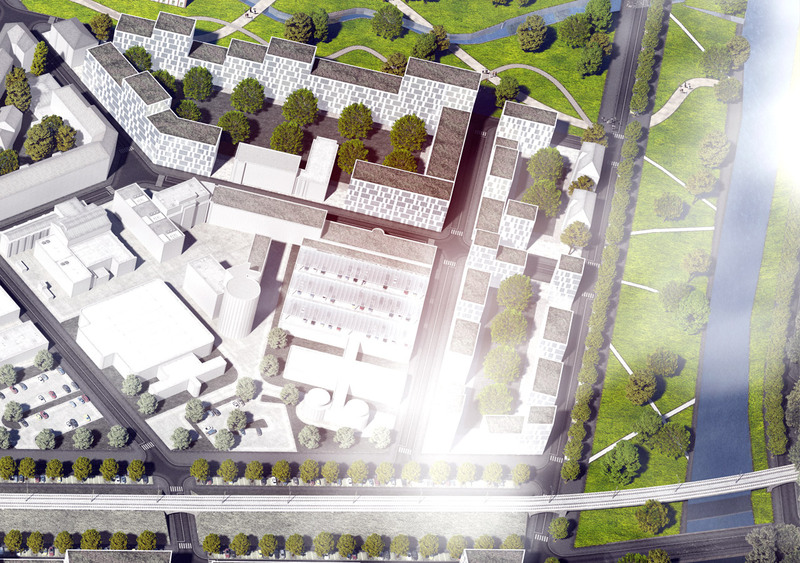 The goal is to create a level playing field for new, concentrated private development. Every living city is mixed-use. We are not prescribing land use of private property. Plenty of health, environmental and legal regulations are already in place to eliminate the negative effects of inappropriate activities. We propose fundamental changes to the organization and philosophy of this area. This cannot happen overnight and a gradual fulfilment of the vision is planned. We propose several stages to help us gain momentum over time. 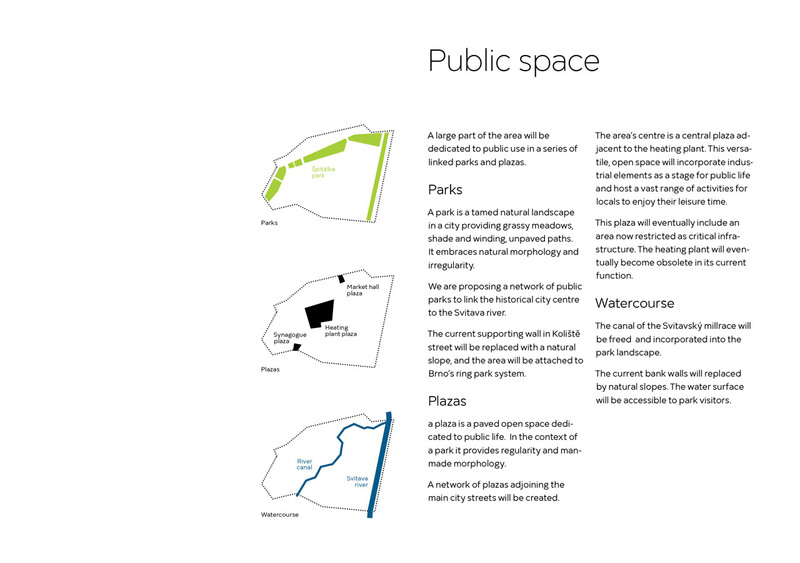 Stage 1 – The park and central plaza are built on available land with minimum demolition requirements. 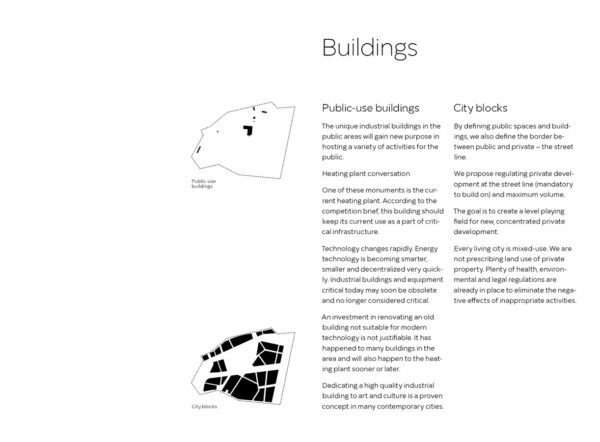 A regulated plan specifying new blocks is defined. The goal is to make sure that any new private development in the area is in accord with the proposed plan. Stage 2 – Buying out and demolition begins in order to build the southern avenue (along the railways) and the city’s new boulevard. Stage 3 – Buying out and demolition begins for the northern border of the park in order to build the northern Kemka avenue. Stage 4 – The remaining network of cross streets is finished. The current E.ON administrative building is demolished and the central plaza is connected through the restored viaduct to the southern avenue. 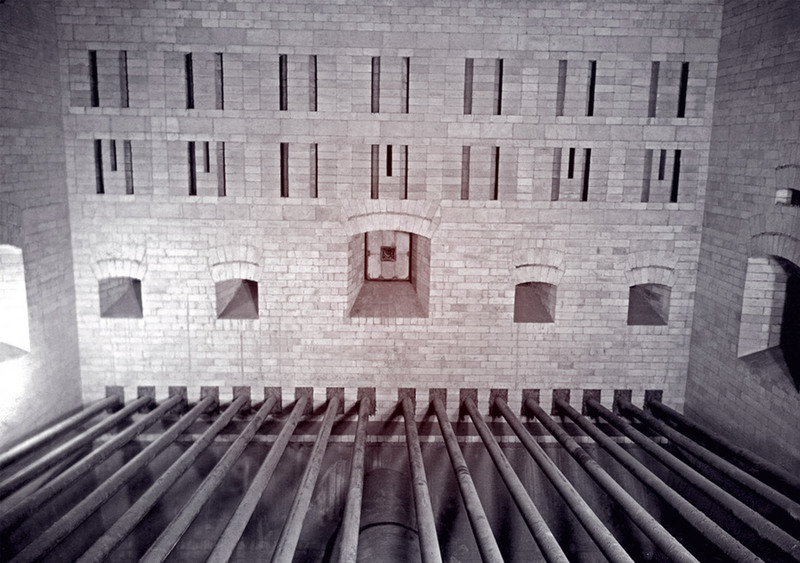 Stage 5 – When the time comes, the old heating plant is converted into an art and culture centre.